I just returned home from a week long trip with my sister, and prior to that I was able to do a long overdue (as in 14 years) girls weekend with my college girlfriends. I have previously written about how traveling has changed for me over the years as my relationship with food and exercise has changed. Yet, I am still often reminded of how far I have come when I travel. This is even more apparent when I travel alone or without my children as when traveling as a family, I am obviously very focused on their needs vs. my own. But now that I am less focused on exercise and food, I am actually able to focus on so much more when I travel. There were so many incredible things about both these trips but here are the most significant. I think truly connecting with others can be a challenge once you are a mom. Not only is it nearly impossible to have a actual adult conversation with someone else while your small kids are around (either by phone, text or in-person), when you are not with your kids, you are often talking about them, worried about them and thinking about them. Kids take up a lot of mental and physical energy (as they should) but sometimes it is hard to step away from that for a time being. 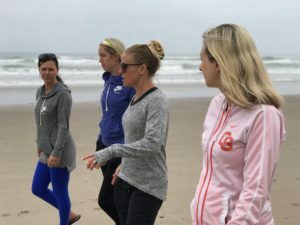 In Oregon with my girlfriends, we had 11 kids among the 5 of us so obviously we were going to talk about kids a lot BUT we became friends before kids and so we are connected differently than some of my current friends and had so many memories before we became moms. After, we all in checked in with our families we were able to truly connect. The fact that we were able to sit down for multiple meals without having to get up 600 times to clean up spilled milk or get an additional condiment or pick up food thrown on the floor was blissful. We could really have a grown up conversation. One of the best parts of the trip was that there was no complaining. It was so refreshing. Not that everyone doesn’t have the right to complain once and awhile, but we did not just sit around and whine about our kids and husbands and how tired we were and how hard motherhood is and how dirty and messy our houses were. We are all constantly exhausted and challenged in motherhood, can relate to each other, are in the trenches right now and trying to do our best. None of this needed to be reiterated. We laughed and shopped and drank wine and talked. 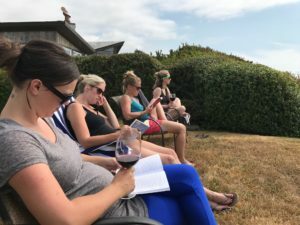 Another favorite moment of mine was when we all sat outside for about an hour in almost complete SILENCE drinking wine and reading. It was blissful. I imagine none of us get to just sit like that very often. Connecting with my sister was another amazing trip. We have not traveled together with just the two of us for 5 years. We talked politics, food, nutrition, exercise, goals, future plans, the past, and more. We enjoyed amazing meals, saw an entire city, sat on our porch every morning and every evening drinking coffee and then wine. 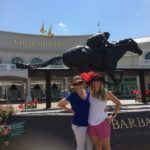 We went to art museums, toured a Bourbon distillery, went to Churchill Downs, took a super funny, cheesy amazing city tour. So different than my daily routine, it was wonderful. Even as a fitness professional, I do spend the majority of my days sitting at my desk like most office workers. Even days I teach and train are for a very small amount of my total day. 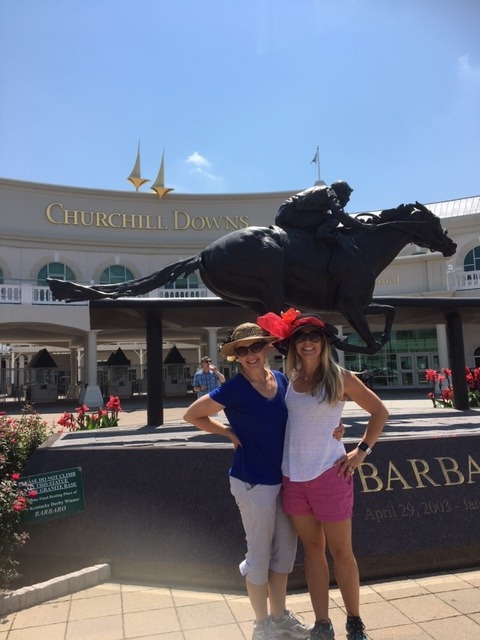 In Louisville, we walked and walked and walked. We walked over 50 miles in 4 and 1/2 days. It was cathartic, it was a great way to see the city, it was even sometimes mentally and physically challenging. It was wonderful. In previous travel, I would have tried to locate the nearest gym and try to plan someworkouts throughout the week. 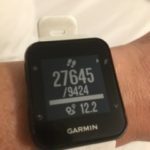 I did pack a resistance band and had planned on going on a run and doing some body weight workouts but after walking an average of 10 miles each day, I did not feel the need (or want) to do any additional workouts. It was probably great for my body to have a total different form of exercise for a week. And the funny thing, I was so friggin sore. Sore as in I had done hours of high intensity exercise. My calves were tight and my hips ached by the end of the day. There was no way I was going to do any additional working out. As my sister joked (who just came off a 5 month around the world trip with a lot of walking, check her adventures out here), I am ‘gym fit.’ But it is fairly accurate. I can teach or take a hard 60 minute group exercise class or a complete an intense CrossFit workout but walking a city for 4 days left me aching. It was amusing and humbling and made me think about spending more time on my feet throughout my work day. One of my favorite activities but also an activity that use to bring me some anxiety. 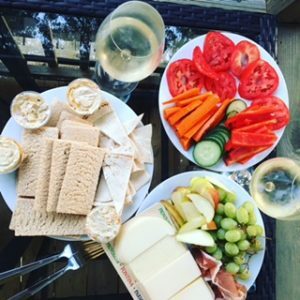 I use to try to bring so much food with me when I traveled as I was constantly worried that I might be in a place that did not have healthy options. Then I would have to chose between being hungry, since I would not want an unhealthy option which I thought would lead me to eat more later due to hunger or eat the less healthy option and feel guilty. Wow. So much mental energy was spent on this! My sister use to joke that I literally always had food packed with me where ever I was going and this was before motherhood, when of course you need snacks with you at all times for the littles. Yes, I often pack some type of snacks as I do not want to be eating airport food all the time and I also like snacks but I used to pack pre-portioned ziplock bags of protein powder and oatmeal and more and then when I arrived at my destination would need to scope out the food scene and grocery store options almost immediately. What I have discovered is that I am going to be okay. I am not going to the Sahara I am not going to die without food for a few hours or even without healthy options and even if I decide to pick the less healthy option, does not immediately negate my consistent healthy eating and exercise. In Kentucky, we ate 2 meals most days and one night we opted to hit the grocery store for cheese, vegetables and crackers. The food in Louisville, to my surprise was amazing. Louisville has much pride in their food and is very big on locally sourced food. One restaurant we went to had large black and white photos of the farmers where they sourced their food as the restaurant’s artwork. All our meals were really delicious and a memorable part of the trip. I am a creature of habit and generally thrive on routines. But it is so good for our mind, body and soul to get out of those routines. I cannot wait to travel again and hope that you find some time to travel and connect, walk and of course eat delicious meals.